The Thunderbird machines were a series of speculative fiction machines imagined for the mid-1960s film and television Thunderbirds series, developed by Gerry Anderson. The released work began with the Supermarionation television series Thunderbirds and was followed by subsequent feature films Thunderbirds Are Go and Thunderbird 6 in 1965–68. The series featured a large variety of futuristic air, land and sea vehicles and machines, the majority of which were designed by special effects director Derek Meddings. In the context of the series, most of the advanced machines appearing in the series belonged to the International Rescue organisation and were used during their rescues. These were known as the "Thunderbirds", of which there were five core machines and a variety of other rescue craft. It was after these that the series was named. In the series, all of the International Rescue vehicles were designed by the organisation's resident technical genius known as Brains. The use of these models in Anderson's Supermarionation productions beginning with Supercar was a significant advance in television production. Before Supermarionation, scale models had generally been limited to the cinema. Meddings's models introduced a new level of realism and quality; while most TV and motion picture aircraft and spacecraft of the time were clean and polished, the Thunderbirds machines (and most others in the series) show the effects of wear and tear. This dirt and wear was applied as a way of adding realism and countering the miniature models' toy-like appearance. A sleek, variable geometry (swing wing) hypersonic rocket plane used for fast response, rescue zone reconnaissance, and as a mobile control base. Thunderbird 1 is endowed with VTOL capabilities which are demonstrated in many episodes, and its take-off from Tracy Island is most often vertical. The length of Thunderbird 1 is a matter of debate, with various sources giving values of 80, 100 and 115 feet (24, 30 and 35 m). However, the last figure is now generally accepted, placing the aircraft wingspan at 80 feet (24 m). With a maximum speed of 15,000 miles per hour (24,000 km/h) (Mach 19.7), it can reach anywhere on Earth within an hour's flight if a great circle route can be flown. Thunderbird 1 is hangared beneath the main house on Tracy Island, and launches vertically from a pad camouflaged by a swimming pool which slides aside. The aircraft is primarily piloted by Scott Tracy, with Alan taking his place when he is unavailable as Thunderbirds 1 and 3 are rarely required on the same mission (such as in the episode "Atlantic Inferno", where Scott, as the eldest Tracy brother, takes charge while Jeff is on holiday). Jeff described it as "sleek, first and fast" at the beginning of Thunderbird 6. As the reconnaissance craft, it featured in virtually every episode of the series as a means of assessing what vehicles would be required for a rescue. One of the most popular gaffes noticed amongst Thunderbirds fans is the pilot's ability to control almost all of the many functions of the rocket by simply moving one of the two control levers forward or back. This is explained by other Thunderbirds fans as a precursor to the current system of electronic joystick controls that are backed up by sophisticated avionics computers. Thunderbird 1 does not appear in the episodes "Sun Probe", "The Imposters", "Ricochet" and "Give or Take a Million". It appears in the 2004 live action film Thunderbirds, where it has an updated look similar to the original; coloured silver grey, with blue and yellow detailing and red nose cone. In "The Uninvited", Thunderbird 1 was shot down by the Zombite Fighters and crashed into the desert but Scott was soon found by two explorers. In the series Thunderbirds Are Go, Thunderbird 1 retains the same role it has in the original series. However, like all of the Thunderbirds, it is able to be piloted remotely via Scott's wrist console. Thunderbird 1 also possesses an electromagnetic cable that can be fired from the open cargo bay, allowing it to lift or tow objects. The electromagnet at the end of the cable can be swapped for a clip. Thunderbird 2 is International Rescue's heavy-duty transporter aircraft which carries rescue equipment to the danger zone in one of 6 pods (including Thunderbird 4 in pod 4). 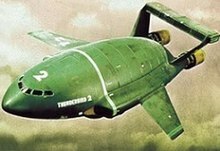 Thunderbird 2 is a large, green VTOL aircraft that is used in most earth-based rescue missions. It is piloted by Virgil Tracy, who is often accompanied by either Scott Tracy, Alan Tracy, Gordon Tracy, Brains or sometimes Tin-Tin. Thunderbird 2 is 250 feet (76 m) long with a wingspan of 180 feet (55 m) and a height of 60 feet (18 m). A long-range craft, it is capable of reaching anywhere in the world without refuelling, often shown flying just above sea level, and has a maximum speed of 6,000 mph (9,700 km/h) (but cruises at 2,000 mph (3,200 km/h)). It therefore arrives at the danger zone later than Thunderbird 1. Gerry Anderson's design error on the original TB2 was corrected in later renditions. The telescopic legs which raise the craft were placed on the superstructure which prevented the pods from being loaded from a conveyor belt as seen in the original series' opening credits. The launch sequence begins with Thunderbird 2 taxiing through a concealed hangar door disguised as a cliff face onto a runway flanked with palm trees that fall back to accommodate the large wingspan. The aircraft is then raised on a platform until it is at the correct angle for take-off. A blast shield rises at the rear of the launch ramp, channelling the exhaust of the rear engines through a series of tunnels to the other side of the island. The need for Thunderbird 2 to launch from Tracy Island using a ramp is unclear, because at all other times it takes off using its VTOL thrusters. One possible reason may be weight, specifically the weight of fuel because some the fuel used to fly will be expended during flight from Tracy Island to the place it carries out its mission. In "Terror in New York City", Thunderbird 2 was fired upon and crippled by the USN Sentinel, and remained out of operation for the rest of the episode. The vehicle was subsequently repaired using parts sourced from several different aircraft companies in order to protect the secrets of the aircraft's design. Thunderbird 2 holds the distinction of being the most frequently seen of all the Thunderbirds, appearing in all but one episode of the TV series ("The Impostors") and also appearing in all three films. Thunderbird 2 features a slightly updated design (with the Pods a rectangular prism) in the series Thunderbirds Are Go while still retaining its traditional role of the team's workhorse. The craft now features the same electromagnetic cable reels as Thunderbird 1, though they can only be used if Thunderbird 2 has no modules attached. The contents of Thunderbird 2's modules differ slightly from the original series. Module 1 contains a large speaker, used primarily to emit Low-Frequency Sound Waves for use against large fires. It also comes with two under slung liquid nitrogen cannons. Module 2 contains three "Pods," special units that can be converted into a number of different rescue vehicles such as the Mole. Module 3 contains electromagnetic "grabs," large claws designed to lift objects heavier than the standard electromagnetic cables can handle. The nose of the craft also contains a set of grabs that can hold a set of seats for lifting people. Module 4 contains Thunderbird 4. Like the other Thunderbirds, Thunderbird 2 can be piloted remotely via Virgil's wrist device. A reusable, vertically launched SSTO (Single Stage To Orbit) spaceship used for space rescue and maintenance of Thunderbird 5. Thunderbird 3 is 287 feet (87 m) long, with a 23 feet (7 m) wide body and a 79 feet (24 m) span (including engines). Thunderbird 3 is unique among the Thunderbird craft in having its dimensions quoted in an episode of the series: in "Give or Take a Million" Jeff Tracy states that the spacecraft stands 287 feet (87 m) high. However, Brains, the designer of Thunderbird 3, said in a videotaped interview, that Thunderbird 3 was "200 feet [61 m] in height. " Another problem with the stated size is evident in the Thunderbird 3 launch scenes. For the craft to be over 200 feet, the ceiling of the roundhouse it passes through on take-off would need to be in excess of 50 feet (15 m) high and the balcony rail 25 feet (7.6 m) high. [original research?] The Saturn V is 111 metres (364 ft) high at launch, adding validity to the 200-foot height theory. The spacecraft uses chemical rockets for lift-off and boost, and an ion drive for propulsion while in space. Thunderbird 3 is hangared beneath the "Round House" on Tracy Island, and is primarily piloted by Alan or John Tracy, although Scott often co-pilots. Since John is usually seen in Thunderbird 5, he is rarely seen piloting the spacecraft (only in "The Mighty Atom" and "Danger at Ocean Deep" and "The Uninvited", and never in a rescue situation). In "Ricochet" Virgil is seen piloting Thunderbird 3. This craft was used for space rescues in "Sun Probe", "Ricochet", "The Impostors" as well as escorting Zero X briefly in Thunderbirds Are Go. Thunderbird 3 features a slightly different design in the series Thunderbirds Are Go. The three support structures on the engines are now grapple arms that can swing forward, which hold four electromagnetic cables each, and the nosecone of the craft holds a drill. The cockpit area is able to rotate to keep the pilot oriented "up" in relation to Earth regardless of the orientation of the rest of the craft. Like Thunderbird 2, Thunderbird 3 features a customizable Pod vehicle in its cargo bay. Like the rest of the Thunderbirds, Thunderbird 3 can be piloted remotely via Alan's wrist device. A small utility submersible for underwater rescue, Thunderbird 4 is carried aboard Thunderbird 2, nearly always in Pod 4, although it was once transported in Pod 6 ("Attack of the Alligators"). 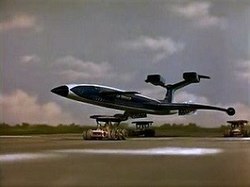 In the episode "Terror in New York City", Gordon launches the craft by emergency procedure, from the Thunderbird 2 hangar and sliding along the island runway, with the runway's overhang automatically dropping into the sea as Thunderbird 4 approaches it. However, the submarine's slow speed renders it impractical for Thunderbird 4 to travel on its own; when Thunderbird 2 was temporarily out of action and Thunderbird 4 required, Jeff Tracy contacted the navy vessel Sentinel - the fastest ship in the fleet and unintentionally responsible for incapacitating Thunderbird 2 in the first place - to give Thunderbird 4 a lift to the danger zone. Thunderbird 4 is 9 metres (30 ft) long and 3 metres (9.8 ft) wide, this makes it the smallest of the Thunderbirds vehicles, but not the smallest of the pod vehicles. It is fitted with an adjustable searchlight which can be raised or lowered to reveal a variety of rescue instruments, such as cutting lasers, electromagnets, demolition rockets and battering rams, which can be extended from the nose section. Thunderbird 4 is piloted by aquanaut Gordon Tracy. Thunderbird 4 does not play an active role in the films Thunderbirds Are Go (1966) and Thunderbird 6 (1968). It does however appear in the opening title sequence of Thunderbirds Are Go. In Thunderbird 6, Jeff Tracy gives a "run down" on each of the Thunderbirds machines, where Thunderbird 4 makes a brief appearance. It also appears in the 2004 live action film with an updated design. However, it is handled by Alan Tracy instead of Gordon because Gordon is unavailable. Thunderbird 4 has few new features in the series Thunderbirds Are Go compared to its original counterpart, now possessing a pair of deployable grapple arms and two "dry tube" evacuation pods in the rear of the vehicle. It is able to be piloted remotely via Gordon's wrist device. During a rescue mission on Europa, it was shown that Thunderbird 4 can also be transported in Thunderbird 3, although it was also provided with various new features to cope with the icy conditions on Europa. The largest rescue vehicle of the Thunderbirds inventory, Thunderbird 5 is an Earth-orbiting space station which monitors all broadcasts around the globe for calls for help and also manages communications within International Rescue. Measuring 122 metres (400 ft) long, 90 metres (300 ft) wide, and 83 metres (272 ft) tall, Thunderbird 5 is equipped with almost completely automated onboard systems, allowing the entire station to be run by a single crew member. Thunderbird 5 is primarily commanded by John Tracy, although he is periodically relieved by Alan (according to the storyline, John and Alan swap roles once a month, one piloting Thunderbird 3 and the other monitoring Thunderbird 5, but such was writer Gerry Anderson's dislike for the character of John, that he was usually exiled to the space station). Derek Meddings designed Thunderbird 5 after the other machines and apparently based the design on the Tracy Island Roundhouse model (through which Thunderbird 3 launches). Thunderbird 5 is in a geosynchronous orbit, 22,400 miles (36,000 km) above the Pacific Ocean, and believed to be above Tracy Island. Thunderbird 5 is electronically cloaked to avoid detection from ground-based radar or other spacecrafts’ sensor systems. In the series Thunderbirds Are Go, Thunderbird 5 features the most extensive redesign of the fleet. It now features a rotating habitation ring, which uses centrifugal force to provide occupants with artificial gravity. The station has a holographic computer system, also present within the Tracy home as well as the other Thunderbirds, which allows John to have face-to-face conversations with the rest of the team and display information relevant to missions. Thunderbird 5 is equipped with a space elevator, a rocket-equipped pod on a length of cable, which lets John travel between the station and Tracy Island at will, without having to rely on Thunderbird 3. The station is also equipped with one configurable Pod vehicle. Thunderbird 5's surveillance and data technology is far advanced compared to its original counterpart, with it able to access almost any kind of digital information that is not secured. From the episode "EOS" onward, the station is co-operated by the artificial intelligence EOS, which has access to all of the station's systems. A six-wheeled Rolls-Royce motor car used by Lady Penelope and her chauffeur, Parker. The car has an aircraft-style canopy and is fitted with many gadgets including an air-cooled machine-gun located behind the Rolls-Royce grille. Lady Penelope's yacht which featured in the episode "The Man From MI.5". Parker seemingly lost the vessel after using it as currency in a game of poker. Small personal transports that hover above the ground, used by all members of IR. These vehicles were also seen in Anderson's earlier series Fireball XL5. They were used to get around the fact that the puppeteers could not make the marionettes walk realistically. A mobile command center carried aboard Thunderbird 1, usually manned by Scott Tracy once Thunderbird 1 is on-scene at a rescue operation. A remotely operated flying camera designed to withstand extreme heat. Also carried aboard Thunderbird 1. A "wristwatch" designed by Brains to communicate with members of International Rescue. Seen in Move – and You're Dead and Day of Disaster. Constructed of titanium alloy, a screen beneath its face displays TV images, the time, or computer data. Thunderbird Shadow (or Thunderbird S) is presented as the newest addition to International Rescue's fleet of vehicles in the reboot series Thunderbirds Are Go. Black in colour, it is a VTOL-capable and highly agile hypersonic stealth aircraft piloted by the organisation's Head of Security, Tanusha "Kayo" Kyrano. It is primarily used for covert operations directly related to protecting International Rescue. The cockpit section doubles as a high speed "Shadow Bike" motorcycle, which can be dropped to the ground from the craft's fuselage when aerial pursuit isn't practical while still remaining in remote control contact with it. In place of traditional landing gear, the ship is endowed with a pair of bird-like legs with talons that allow it to perch onto any surface, including vertical walls; the talons have also been used to carry cargo. In addition, the ship also features electromagnetic cables, a sonic cannon, and "optical camouflage" cloaking technology, allowing it to appear invisible to the naked eye and radar. Thunderbird Shadow's launch area on Tracy Island is located on a rock outcrop in a hangar shared with Thunderbirds 1, 3 and 4. It is carried backwards on a turntable up a wall via a rail. The turntable then rotates 180 degrees so the craft's nose faces up, while the wall flips around to take the ship outdoors (the exterior is disguised as a rock facade of the island). Thunderbird Shadow takes off from there. Thunderbird Shadow was designed by Shōji Kawamori, best known as the creator and mechanical designer of the Macross franchise. Used to replace trains and the London Underground and New York City Subways. Monotrains travel along overhead railings magnetically. They appear in "The Perils of Penelope", "Brink of Disaster" and another version of them is seen during "The Mighty Atom". A military walking vehicle that appeared in the episode "Pit of Peril". It resembles a giant lobster. Powered by an atomic reactor, the four-legged Sidewinder has two mechanical arms at the front which are used to uproot trees and move aside other obstructions. The vehicle is operated by a crew of three from the cabin at the front. At 50 metres (160 ft) long and weighing over 500 tonnes (490 long tons; 550 short tons), the Sidewinder is slow and lumbering, but is capable of crossing terrain inaccessible to other land vehicles. The vehicle was developed to prevent South African "brush fire" wars from escalating into larger conflicts and is equipped with a significant amount of weaponry. The prototype vehicle fell into an unmapped landfill pit during testing. Due to spontaneous combustion of the rubbish the inside of the pit was extremely hot. Later versions of it were equipped with emergency anti-gravity generators for use in situations like that or if one of its legs has been removed. This huge yellow tree-felling machine featured in the episode "Path of Destruction". Powered by an atomic reactor, but with a wood processing plant dependent on the chemical fuel 'Superon', the Crablogger was designed by Jim Lucas of Robotics International in England. The machine was equipped with two large arms with a giant central chainsaw which would cut a tree at the base before passing it through an opening at the front. Inside the Crablogger, the tree was reduced to wood pulp which was regularly collected by tankers. Designed to clear areas of forestation to make way for road developments, much of the Crablogger's systems were automated, although a crew was required to monitor these systems. In the episode "Path of Destruction", the crew were incapacitated by food poisoning, resulting in the machine going out of control. The Highway Delva was a giant mobile machine that acted as the command centre and primary construction unit of road construction companies. The giant machine ground up rocks and trees as it moved over them, and flattened the ground before laying a four-lane motorway behind it. Astonishingly, the motorway is complete to the inclusion of roadway markings, as well as roadside fences. Moving on a series of caterpillar tracks, the vehicle was equipped with a helijet pad, and a cannon for clearing obstacles. The machine also carried tracked explosives tractors for clearing larger obstacles. Highway Delvas appeared in the episodes "End of the Road" and "Atlantic Inferno". A 16-tonne tractor used by the Gray & Houseman Construction Company for clearing large obstacles by using rear-mounted mortars to launch nutomic explosives. It can be used in mountainous regions thanks to its high-performance engine and traction capabilities. These tractors are kept in Highway Delvas when not in use. On board the vehicle are hand-held digging tools and a computerised seismograph and sensor monitoring station. A next-generation United States Navy strike vessel that appeared in the episode "Terror in New York City". Commissioned in January 2064 and built in the same year, it has a top speed of 200 knots (370 km/h; 230 mph), which Virgil described as "phenomenal" when he detected it. The warship is 720 feet long, has a beam of 98 feet, and a displacement of 51,270 tons. Unfortunately, the Sentinel also detected Thunderbird 2 and launched a missile attack, having erroneously identified Thunderbird 2 as an enemy aircraft since it was too slow to be a missile, too fast to be a civilian aircraft and did not match any U.S. military aircraft. Although the Sentinel was prevented from fully destroying Thunderbird 2 when an identification signal was transmitted at the last minute, the damage sustained to the ship's engines crippled it for the rest of the episode. Subsequently, the Sentinel helped International Rescue to save some reporters from drowning in an underwater river in New York by taking Thunderbird 4 aboard and carrying it near the city, as Sentinel was the only available craft capable of transporting Thunderbird 4 that was fast enough to take it to the city in time to make a difference. In addition to customs and excise duties, the Coast Guard Launch also serves as a backup service for lifeboat operators. The vessel weighs 14 tonnes, has a length of 22 metres, and can use its hydrofoils to achieve speeds up to 100 knots. Seen in the episodes Operation Crash-Dive and The Man From MI.5. Fireflash as seen in "Trapped in the Sky"
The Fireflash, a hypersonic airliner, appeared in the episodes "Trapped in the Sky", "Operation Crash-Dive", "The Impostors", "The Man From MI.5" and "The Duchess Assignment", as well as in a flashback sequence in "Security Hazard". It has six atomic motors that enable it to stay in the air for a maximum of six months; however, their radiation shielding must be maintained frequently, or the passengers will be able to spend a maximum of only three hours in the aircraft before succumbing to radiation sickness. It weighs 1,806 tons, has a wingspan of 180 feet, is 380 feet in length, and its maximum speed is Mach 6 (approximately 4,500 mph or 7,200 km/h), and it can fly at heights above 250,000 feet (76,000 m). A novel feature is that the flight deck is built into the tail fin. Like many in real life, this aircraft has two decks, but also features luxury facilities such as a cocktail lounge housed within glazed sections of the wings' leading edges. Fireflash was commissioned by Air Terrainean (a.k.a. : Terrainean Airways). Multi-purpose jet-powered VTOL aircraft, helijets appear in numerous episodes and are widely used by civilian and military organisations. A variety of different designs are seen over the course of the series and were also seen in Anderson's next series Captain Scarlet and the Mysterons. Some versions seem to be based on the fuselage design of the Kaman HH-43 Huskie helicopter of the early 1960s. It is assumed that the production team modellers modified commercial plastic models (probably the 1/32 scale Hawk kit) of the helicopter for use in the series. The EJ2 is a civilian cargo aircraft, some of which have been adapted for use on air-sea rescue missions by the World Navy. This modified variant contains a wide variety of equipment such as a rescue launch. The aircraft appears in Operation Crash-Dive and The Impostors. Skyship One is a large technologically advanced airship which appeared in the second Thunderbirds feature film, Thunderbird 6. Commissioned by the New World Aircraft Corporation, the airship was designed by Thunderbirds creator Brains under the pseudonym of "Mr X". The ship requires only a skeleton crew, as the systems are entirely automated, with destinations pre-programmed before take-off. Key to the airship's design are the gravity compensators; incorporating technology developed for Thunderbird 5, they effectively reduce the airship's weight allowing it to become airborne. Inside, the cabins and facilities are luxurious and include several themed rooms and bars. The Red Arrow is a fighter jet seen in Edge of Impact. It has outstanding manoeuvrability, rate of climb, and speed courtesy of being powered by "twin rockets", which Jeff describes as a "new field". The first two of this aircraft were destroyed by the Hood for General Bron, a military leader from a rogue state. The model appears to be based on a SAAB Draken, dressed up with four extra jet engines. A large, supersonic passenger airliner designed by Brains (although he claims that he only designed some of its new experimental features) which featured in the episode "Alias Mr. Hackenbacker". It is considered the safest aircraft in service, largely due to its unique safety feature in the form of an ejectable fuel tank. In the event of a crash landing, the fuel tank separates from the main body of the aircraft, allowing the plane to land safely with minimal risk of fire or explosion. The fuel "rocket" is then guided to a safe altitude before self-destructing. The Carrier Craft is an aircraft operated by the World Airforce. Its deck provides the means for carrying outsized loads, similar to the Antonov AN-225 'Mriya'. In the Episode in which it is featured, The Duchess Assignment, it was used to test a new system where a smaller aircraft could land on its back and control it by remote control, analogous to the Mistel . The Carrier Craft is 170 feet in length, has a wingspan of 161 feet, a range of 15,000 Nautical Miles, weighs 41 Tons when empty, and has a top speed of 570 mph. The Sun Probe is a rocket that was sent to collect a sample from the Sun for research purposes. However, the radiation from the Sun caused the retro-rockets to fail, resulting in it going on a collision course with the Sun until Thunderbird 3 was able to activate the rockets by remote. It first featured in the eponoymous "Sun Probe" and (briefly) in the later produced episode "Perils of Penelope" . A metallic-blue spacecraft that made the first manned landing on Mars. Zero-X first appeared in the first Thunderbirds feature film, Thunderbirds Are Go, and subsequently in the first episode of Captain Scarlet and the Mysterons. It is assembled hours prior to launch and consists of 5 parts: The MEV (Martian Exploration Vehicle), the main fuselage, Lifting Body 1 and 2, two wing-like structures loaded with thruster packs and also incorporate landing gear at the ends, and the reflective Nose Cone, which is a large metallic nose which attaches to the MEV. Appearing in the episode Day of Disaster, the Martian space probe is an automated mini-rocket designed by Professor Wingrove and built to rival the Zero-X project. Due to the position of Mars, it was shipped over to England to take off. En route to its launch site, the Allington suspension bridge collapsed under its weight, sending the rocket to the bottom of the river. The intervention of International Rescue saved two technicians inside the command module, but the spacecraft's main body was destroyed. ^ Bleathman. Supermarionation cross-sections. Carlton Books. pp. 18–19. ISBN 1 84222 411 5. ^ Bleathman. Supermarionation cross-sections. Carlton Books. pp. 20–21. ISBN 1 84222 411 5. ^ Bleathman. Supermarionation cross-sections. Carlton Books. pp. 22–23. ISBN 1 84222 411 5. ^ The Brains Behind Thunderbirds (1965/2000), Carlton International Media Limited. Appears on Bonus Disc on Thunderbirds: 40th Anniversary Collector's Edition. ^ Bleathman. Supermarionation cross-sections. Carlton Books. pp. 24–25. ISBN 1 84222 411 5. ^ Bleathman. Supermarionation cross-sections. Carlton Books. pp. 26–27. ISBN 1 84222 411 5. ^ Thunderbirds (1965), Century 21 Television/ITC – Series 1 Episode 2: "Pit of Peril". ^ Thunderbirds (1966), Century 21 Television/ITC – Series 2 Episode 2: "Path of Destruction". ^ Thunderbirds (1965), Century 21 Television/ITC – Series 1 Episode 4: "Terror in New York". ^ Thunderbirds (1965), Century 21 Television/ITC – various episodes. ^ Thunderbird 6 (1968), Century 21 Cinema/United Artists. ^ Thunderbirds (1966), Century 21 Television/ITC – Series 2 Episode 3: "Alias Mr. Hackenbacker". ^ "Thunderbirds Episode Guide". Fanderson.org.uk. Bradford, UK: Fanderson. Archived from the original on 30 October 2013. ^ Thunderbirds are Go (1966), Century 21 Cinema/United Artists. ^ Captain Scarlet and The Mysterons (1967), Century 21 Television/ITC – Episode 1: "The Mysterons". This page was last edited on 8 March 2019, at 20:12 (UTC).